Steel and cast iron top plate spiders may vary. Some options are available. See: General Table Top/Table Base Size Recommendations. We are showing table base prices below in small quantities. Bar Height Table Bases With And Without Footrings. 22" X 22" $44 ea. 30" X 30" $53 ea. 36" X 36" $81 ea. 22" X 30" $49 ea. Most Basic Table Bases In Standard Black Finish Ship From Stock. Discounts From Pricing Shown Are Available And Determined By Quantity. 22" X 22" $50 ea. 30" X 30" $61 ea. 36" X 36" $89 ea. 22" X 22" $129 ea. 30" X 30" $139 ea. 33" X 33" $179 ea. 40" X 40" $203 ea. 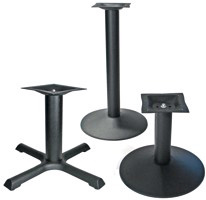 Most Basic Bar Table Bases In Standard Black Finish Ship From Stock. Discounts From Pricing Shown Are Available And Determined By Quantity.